Many of us dream of having a perfect smile. But you may not realize that that dream can become a reality thanks to porcelain veneers. This remarkable procedure involves applying a thin layer of porcelain material directly over the patient’s natural teeth. The porcelain material is the most durable dental ceramic available today, so it is next to impossible to damage veneers. Because they are applied directly over your own natural teeth, they look like your teeth only better! To help you decide whether porcelain veneers are right for you, Dr. Parma is pleased to offer a free consultation to his patients from throughout the San Antonio, TX, area. 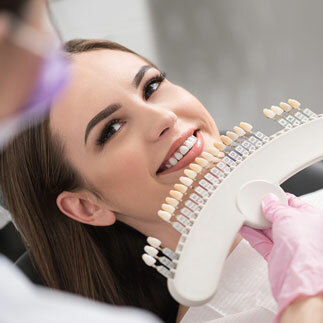 Dr. Parma and his staff of dental professionals have the experience and the tools necessary to provide high quality dental veneers to their patients. We use our specially designed porcelain oven to create veneers of any shade, and to make sure that your veneers look as much like your normal teeth as possible – except, of course, much better! Porcelain veneers are one of the easiest ways to achieve the kind of beautiful smile that you may have never thought possible. The first step involved in getting porcelain veneers is for Dr. Parma to prepare the surface of your natural teeth. After that, he applies a thin layer of extremely strong porcelain material directly over your tooth surface. It’s a simple and quick process, requiring only a single visit to our San Antonio, TX, office, but the results are amazing! For more information about porcelain veneers, or to schedule an appointment with our office, contact us today. Dr. Parma would be happy to consult with you free of charge to determine whether porcelain veneers are the right choice for you.